If you’re looking for a good pair of Bluetooth earbuds that offer impressive sound and water-resistance for workouts, today is your lucky day. 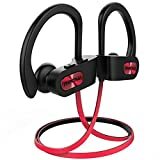 The Mpow Flame Bluetooth Headphones don’t just have a cool name, they offer terrific features and performance at a price that’s more than reasonable. But the price is even more reasonable than usual this week, because these best-selling Bluetooth earbuds are on sale for just $19 until the end of the week. Definitely check them out before this sale ends. ENHANCED COMFORT & WEARABILITY: 1. We have improved the ear hooks to the proper hardness. 2. Additionally come with a pair of memory-foam ear tips and a cord clip, besides 3 pairs of regular ear tips in different sizes for your custom fit. 3. Suitable for normal size ears.